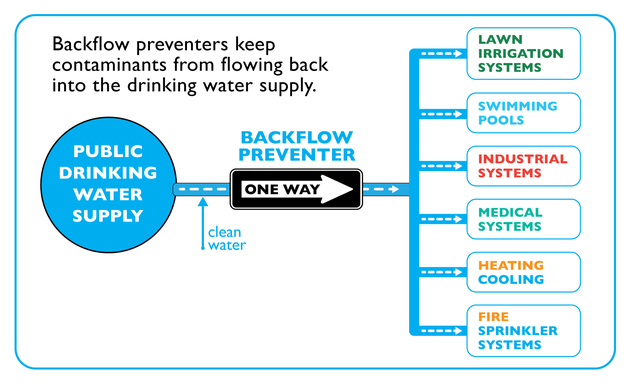 DC Water's Compliance Program promotes and enforces backflow prevention to reduce health risks posed by cross-connections. The Compliance Program's goals are educating the public on the importance of maintaining backflow preventers, eliminating unnecessary cross-connections, and preventing backflow incidents through inspection and regulation. A cross-connection is a point in the drinking water system where a contaminant or non-potable water can potentially enter the drinking water supply. Examples of cross-connections include connections to lawn irrigation (residential and commercial), fire sprinklers, swimming pools, boilers, cooling towers, chillers and other industrial systems which require water. Backflow preventers and/or air gaps must be used on cross-connections to prevent the undesired flow of contaminants into the water supply. If you are a property owner, manager, or facilities and maintenance service provider, you are responsible for ensuring that backflow preventers are installed correctly and maintained as required by the District of Columbia Construction Codes Supplement of 2013 and District of Columbia Municipal Regulation Title 21 Chapter 54. Questions about cross-connection control should be directed to the DC Water Compliance Program by telephone at 202-364-3144 or through email at compliance@dcwater.com.